CLEARANCE SALE - 50% Discount - Save $20.45! Only 1 available. 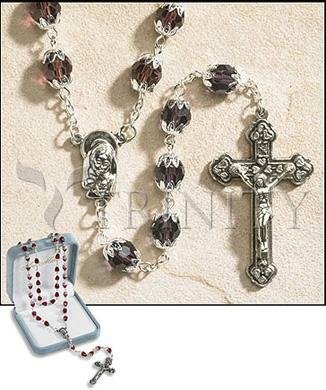 25" Length – 6x8 mm Double Capped Light Amethyst Crystal Bead and 1.75" Crucifix. Beautiful Double Capped Crystal Beads for Light Amethyst birthstone of June. Rosary has 6 x 8mm crystal beads, a silver metal Madonna centerpiece and a silver metal budded Crucifix. Includes a beautiful velvet hinged gift box.